SAN FERNANDO CITY, La Union, Jan. 12 (PIA) -– The Police Regional Office (PRO1) has urged all police directors, chiefs of Police and heads of operating units to intensify police visibility and ensure the honest-to-goodness implementation of the Police Integrated Patrol System (PIPS) in their respective area of jurisdiction. P/Chief Supt. Franklin Jesus B. Bucayu said this during the traditional New Year’s call on PROI to continue the implementation of PNP’s thrust such as the Professional Competency, Rights-Based Policing, and Operational Effectiveness and Efficiency. He also highlighted the Chief PNP’s call for active support to his 10-Point Action plan. We should do in conformity with the overall blueprint for positive change—the Performance Governance System-Integrated Transformation Program (PGS-ITP), or Patrol 2030, Bucayu stressed. 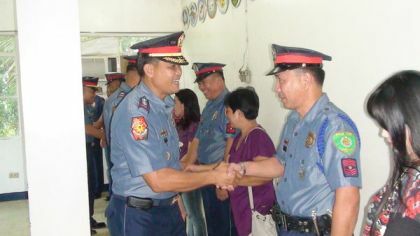 He also reminded the officers to set as example and serve as inspiration to their subordinates as he wished everyone a fruitful 2012. Likewise, he commended all his men in the region for their contribution in making 2011 a year of success.